Rolling Terrace's field in December 2016. Students' families and teachers, led by the Rolling Terrace PTA, convinced Montgomery County leaders to fund field renovations at our school and others with run-down outdoor play areas. This fall, Rolling Terrace students will have--at long last--a safe, grassy school field on which to play games, run or simply relax with friends. 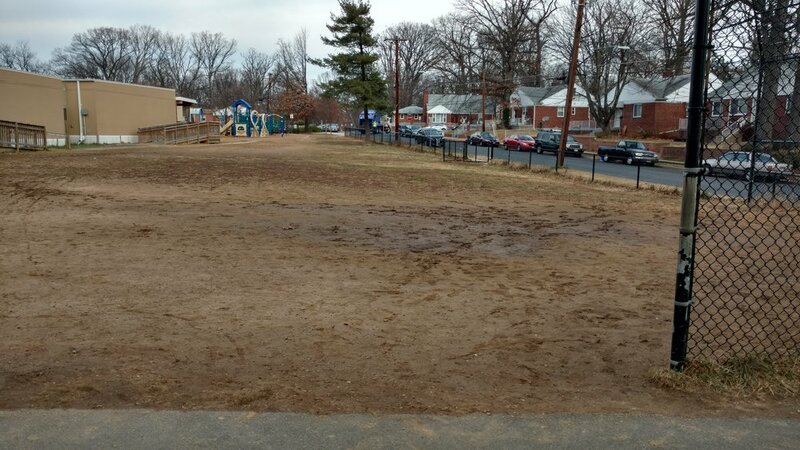 Montgomery County Public Schools will replace Rolling Terrace’s worn-out mud patch (pictured above) with fresh sod and landscaping to keep our field well-drained and healthy year-round. The overhaul will include new playground equipment, too, and work will get underway as the school year begins. The field restoration and new playground are possible because families across our community spoke up together--through the Rolling Terrace PTA--and helped convince our school and county leaders to approve $750,000 specifically to renovate outdoor play areas for students. To score this victory for our kids, Rolling Terrace PTA members led a coordinated, year-long advocacy campaign involving concerned parents and staff from half a dozen schools. The hurdles were many but we cleared each one, first getting the school superintendent to request this dedicated funding, then persuading the county school board and, finally, the Montgomery County Council to include these dollars in their budgets. This successful, parent-powered campaign on behalf of our children perfectly illustrates the values and goals that our PTA stands for--whether the issue is a safe, enjoyable outdoor space for recess or making sure that all students get the academic enrichment opportunities they need. In fact, for her instrumental leadership in this effort, Rolling Terrace parent and immediate past PTA president Lisa Seigel was named PTA Advocate of the Year in Montgomery County. But there’s more to be done. Rolling Terrace PTA members have met with the school district’s facilities staff throughout the spring and summer, ensuring that our voices are heard as school officials considered landscaping and play equipment options. And in the coming months, district leaders are expected to discuss the construction of a new elementary school to help relieve the overcrowded conditions affecting Rolling Terrace and other schools in our part of the county. These decisions matter to us all, and your membership in our PTA makes this all-volunteer organization a more effective advocate for all Rolling Terrace families. Become a Rolling Terrace PTA member! It’s a small but important way that every family can help their children and community thrive. So please, become a member now for the 2017-18 school year--it takes 3 minutes. And after that, maybe check your supply of laundry stain remover… you could be seeing a few more grass-colored streaks on your child’s clothes very soon. P.S. Read more about Lisa Seigel’s award and the many fellow advocates she thanked here. I'm the father of two Rolling Terrace students, Vivi and Bea. I joined the Rolling Terrace PTA when my older daughter started kindergarten in 2014, and I serve as the membership chair. Got a membership question? Ask me.